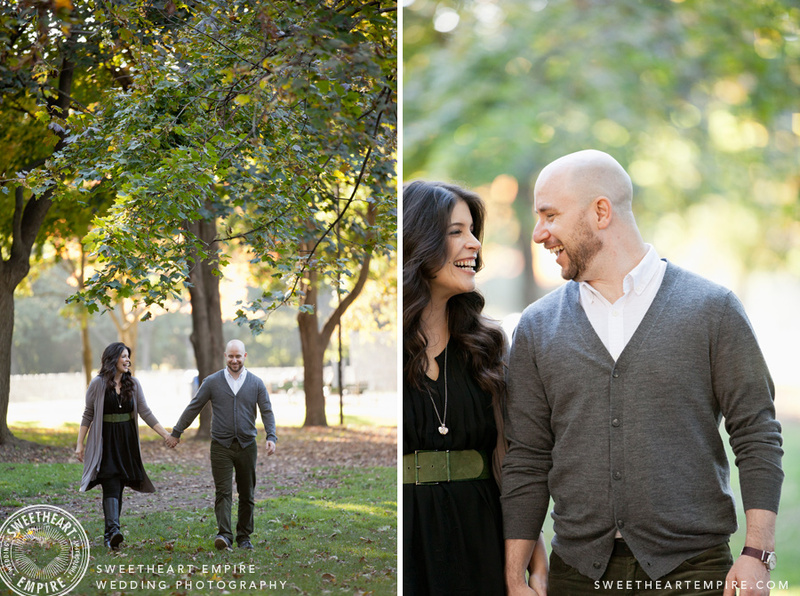 Sarah and Jason took me on a tour of their old neighbourhood for their engagement photos. Davisville and Oriole Park on a sunny autumn afternoon. Best friends before they became a couple, the two went for sushi every week for three years, just for an excuse to spend time together. Then Jason would walk Sarah to the bus stop and wait with her, or Sarah would walk Jason to his nearby apartment where they would, no doubt, linger a little longer near the 1970s water fountain out front… Just a couple more minutes in each other's company. 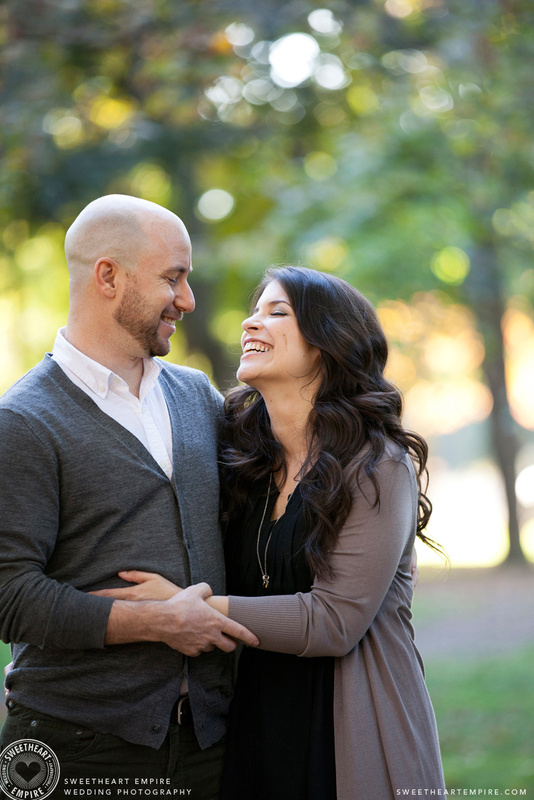 This was a super meaningful session for Jason and Sarah - to take some time in the midst of wedding preparations, to remind each other about how it all began, and why they were doing this in the first place. 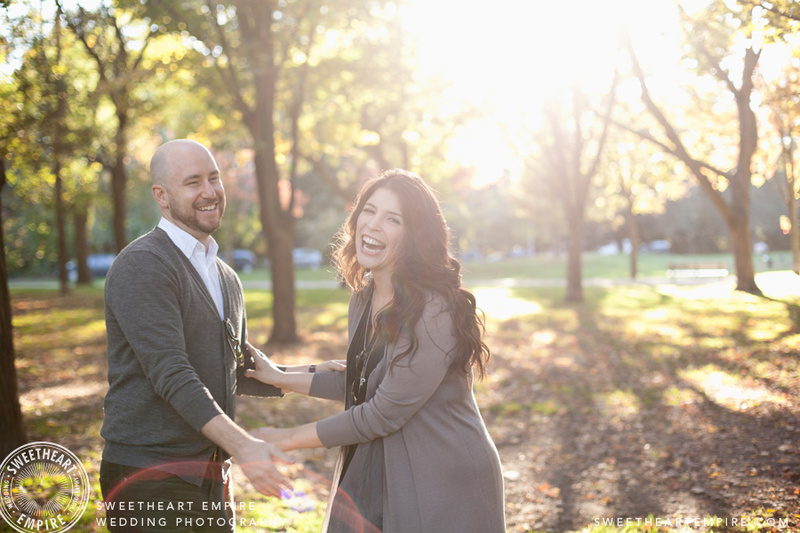 Naturally shy in front of the camera, I used all my tricks to get them engaging together, and soon they were laughing, dancing, and being 150% themselves (including several fantastical discussions about kid-napping cute puppies from the park). When I look at these images I feel like it was truly a photojournalistic experience. The personal nature of their locations and stories allowed real moments to happen that I was witness to (and now you are too). The three of us connected to create something authentic, and to me that is what's so inspiring about true love. Sarah and Jason I feel privileged to have made these photojournalistic engagement photos with you, and I am simply thrilled for your upcoming wedding!